"Votes For Women Never!" 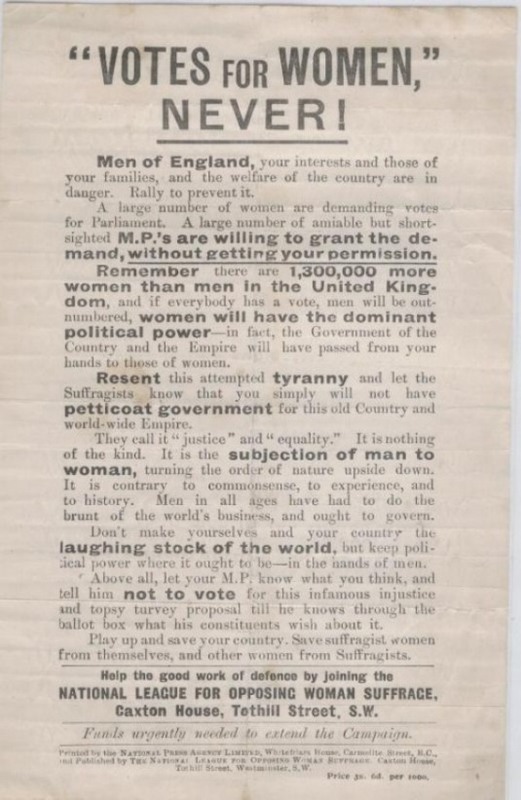 (Anti-Suffrage ad from U.K.). Some early MRAs. HD Wallpaper and background images in the Feminism club tagged: anti-suffrage women's rights united kingdom sexism misogyny newspaper clipping. This Feminism photo might contain 新聞, 紙, 雑誌, タブロイド紙, ぼろ, タブロイド, and 布. This bit of misogynistic propaganda is actually rather fascinating in its various attempts to elicit outrage. "without your permission" - that's kind of how a normal representative government functions. They make it sound like it's some form of injustice recently devised. "women will have the dominant political power" - only if they're all of both the same political alignment and in a way different from all men, which is not how it works. 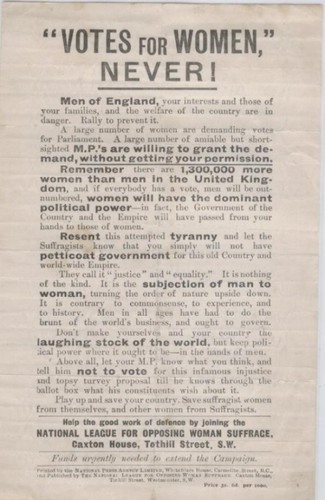 "petticoat government" - this just plays on contempt for femininity. "subjugation of man to woman" - no, only giving women the vote and taking it away from men has this effect, which is the flip of the then-contemporary state of affairs. "laughing stock of the world" - this isn't so much about any form of "tyranny" as it is playing on how femininity is looked down upon in patriarchal societies with respect to how men are encouraged to be macho. Essentially, this is the equivalent of "don't be a sissy". "Save suffragist women from themselves, and other women from Suffragists" - this says that feminists have no idea how to run a country and will hurt everyone. That's a bit different from insinuating that women are trying to take over with an organized force. It also plays on notions of chivalry in that it is men's duty to protect women and that restricting their freedoms is the logical consequence, which reminds me of similar claims made to justify slavery. I am now officially ashamed to be British. LOL, how I love chauvinist's (il)logic.